What I Ching Hexagram 13 All About? Hexagram 13 symbolizes the necessity to bring people together to achieve success. This hexagram also represents the importance of removing distrust from a group to progress. Creating a fellowship is a method used to accomplish a goal that cannot be completed alone. It is a way to unify and strengthen a community that might have low moral status. It is fun to create different projects that a community can come together to complete. This can include cleaning up a local park or repairing buildings to help secure a community. It takes a village to raise a child. Bring together a community and show the importance of working together to the youth. It is a trait that brings together much larger organizations in the future. Hexagram 13 appeals to the benefits of assembling and fellow-shipping. There are pride and joy that comes from participating in a fellowship. There are different kinds of fellowships from religious, to those who wish to improve the community. Normally these groups consist of members who are working towards a great good and work to uplift each other. With any group, there are going to be many personalities that will cause differences and mistrust within a group. This hexagram warns against creating mistrust or confusion within a group. It also shows how you can mend and avoid it. Remember that a fellowship is a group that aims to create a greater good. Every member has the same goal as you but sometimes might have a different moral standard. Be honest and kind with each member of the fellowship to allow them to trust you and also each other. The success of any fellowship relies on the ability of each member to trust each other. When creating a new fellowship, it is sometimes hard to understand each member. Learn about each personality before you start a large project or task. As time passes, and as each member interacts with each other, the true characteristics of each member will appear. A common saying is that you don’t know a person till you live with them. The same applies when you work together to do a difficult job. In love relationships, you have to work together to have a harmonious life. There is no weakness in admitting fault in a relationship in which you have done a lot of hard work. Distrust has no place in this kind of fellowship. In the work area, there is always a situation when a team has to complete a task. Even though each person might have an individual position, it takes a group to accomplish work-related goals. When working with this type of fellowship, misunderstanding is the most common form of conflict. It’s important to communicate effectively and to be clear, get detailed, about any plan that needs to be put into place. Understand what types of communication work best in the work environment. Encourage everyone to use the same form of announcement. When the conflict of distrust does arrive in a fellowship, then there comes time to make a choice. That is whether to continue in the fellowship, or work to dissemble the group. There might come a time when the end goal is complete. And, the group is trying to figure out what to do next. Alternative goals might lead the group down a dangerous path. 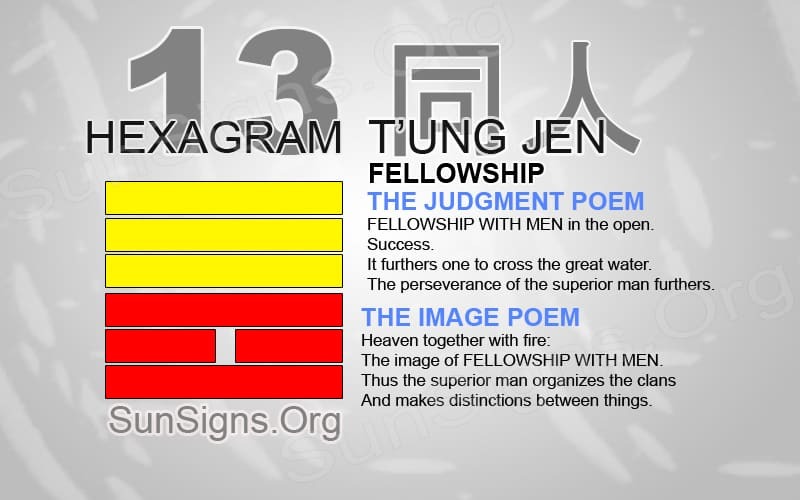 Hexagram 13 is a reminder that greatness comes from working in a fellowship. But, it also warns of the potential danger that can arise within a group. Recognizing any issues can help the group to continue to function.